I am Al Bassett and for over 20 years I have been a member of the Lowrance Electronics Pro Staff. I have lived here on beautiful Lake Oconee in Buckhead, Georgia for over 12 years with my wife Diane. Diane and I spent many years fishing tournaments here on Lake Oconee and all around the State of Georgia. Lake Oconee is located in central Georgia, United States, on the Oconee River near Greensboro and Eatonton. It was created in 1979 when Georgia Power completed construction of the Wallace Dam on the Oconee River. Lake Oconee runs through the counties of Morgan, Greene and Putnam counties in Georgia. It is separated from it's sister lake, Sinclair. Lake Oconee has 374 miles of shoreline with a surface area of 18,971 acres. It is formed by the Oconee and Appalachee Rivers. The lake's height is only 120 feet. Currently although we are no longer able to participate in tournaments my passion for the fishing has not waivered. I love being on the water and helping others find the passion for the sport as I have done. 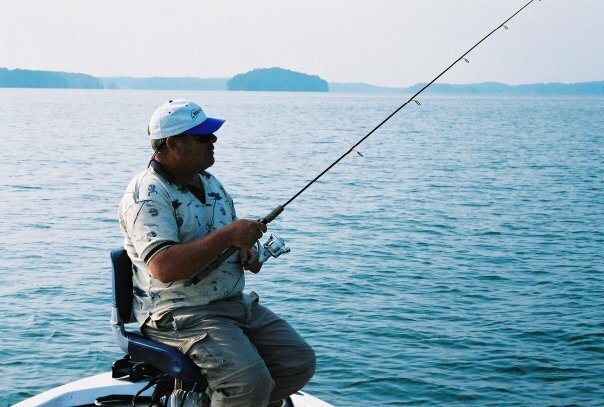 I enjoy taking folks out for a fun day on the lake crappie fishing or learning more in depth uses for the electronics they are using. Call or email me today and let me help you to get the same experiences I do.